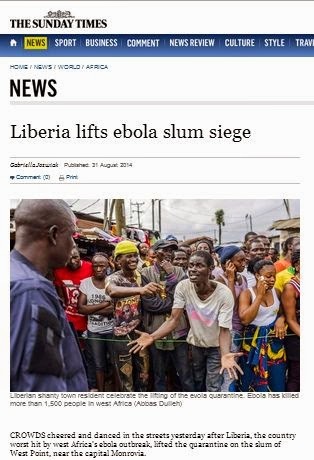 "CROWDS cheered and danced in the streets yesterday after Liberia, the country worst hit by west Africa’s ebola outbreak, lifted the quarantine on the slum of West Point, near the capital Monrovia. Lewis Brown, the information minister, said the decision did not mean there was no ebola in the shanty town, which houses more than 50,000 people. But he said the authorities were confident that they could identify any new cases and that the community was co-operating with the fight against the disease. The imposition of quarantine and a night-time curfew 10 days ago led to protests in which three boys were shot by security forces..."